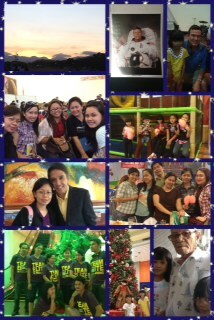 (L-R): Leadership Boot Camp in Clark, Pampanga; meeting the wonderful Fossums (Mike & Terry); new friends in the business; children’s day out/birthday party at Fun Ranch; with ProSpeak President Joey Reyes; mini-reunion with fellow former PLM-SCA leaders; with other Team Elites in Training; an afternoon with the girls at the mall; visit to Papa’s house. “2013 is definitely my year!” It seems like most people I know are saying this, and I am the only one who has not declared it loud and clear yet. We’re just half-way through the first month of the year and I feel like I have not taken a rest yet that I would like to scream! House chores are overtaking me once more and I still need to do some massive re-organizing if I were to be sane for the rest of the year. I have so many records to file and update, people to call and meet… the list is endless that I sometimes no longer want to see my beautiful hard-bound silver organizer – a gift from my sweet husband – as I could easily fill out a week with appointments and things to do in one sitting. Not to mention looking at my lists tends to overwhelm me. On the other hand, I am actually happy to be busy as well. Yes, it’s only been 15 days, but I’ve already learned so much, been to places, met so many people, not to mention, I have already finished a book (Midas Touch by Donald Trump and Robert Kiyosaki) and just started on two new ones (another business book and a devotional). And, I got some invitations to review a couple of books and be a guest writer for another mommy blog. Neat, huh? I suppose 2013 is my year too. After all, I don’t remember ever being so busy during the first half of the first month of the year like I am now, and I certainly look forward to being more productive in the coming days. For now, I shall apply what I have learned from “Midas Touch”, i.e., Focus on One Course Until Successful. Right, that’s FOCUS – something that I tend to lack, though I am happy to announce that for the first time in my life, I shall be completing a 365-day devotional in about a week from now. Oh, that is such an accomplishment for me, especially that I know myself to get easily distracted, if not procrastinate most of the time! And I have somehow accomplished it by diligently opening the YouVersion Bible app on my iPhone almost as soon as I wake up each day. If I could just apply that same diligence and discipline in all other areas of my life, I’m sure (my family and) I would be so much better off this whole year round and in the coming years. Well, at least, I’ve finally got one down… now I’m actually excited to accomplish more tasks! Bring it on, 2013! Next PostLittle girls can have big dreams, too!